Net, net, this tax reform bill could a few very notable things from a macroeconomic and balance of payments perspective if economic agents obey the incentives. First, on the margin it incentivizes capital investment in the United States by, at least temporarily, raising the return on invested capital for owners of said capital. Second, it will add about $1tn of debt to the nation’s balance sheet over the next ten years after taking into consideration the boost to growth the bill could generate. When considering the possible effects of changes to the tax code and budget deficits it’s useful to recall some fundamental identities of national income accounting. First, an individual’s income (i) can only be allocated in any of three ways: consumption (C), savings (S) or taxes (T). This income is generated from the domestic sale consumption goods (C), investment goods (I), government services (G) or net exports (X-M). Therefore, C+S+T=C+I+G+(X-M). We can further simplify the identity to T-G=(I-S) + (X-M). This is to say, deficits (surpluses) on the left side of the equations will result in either a lower (higher) private investment relative to savings, a lower (higher) trade balance, or both. In today’s analog this means that increases in the deficit from the tax proposals will either reduce the nation’s domestic private excess of investment over savings, will cause the trade deficit to expand further into negative territory, or will induce a combination of both. Because this equation must balance (pesky math! ), it cannot be otherwise. So, then, given our current economic conditions and incentives embedded in the tax bill, what is the most likely outcome of either a lower I-S, a lower X-M or both, and what are the ramifications for the USD? It’s clear that the tax bill is designed to stimulate domestic investment. Indeed, taxes on capital profits are being reduced at both the corporate and pass-through level, corporations will be allowed to fully expense – rather than depreciate over time – new capital investments (this lowers current period earnings and thus taxes), and companies with large overseas cash piles will have less disincentive to repatriate foreign earnings, among other features. At first glance this would lead one to to conclude that I-S (the excess of investment over savings) will increase and X-M (the trade deficit) will dip further into negative territory. That is to say, in order to finance a capital expenditure boom and fiscal stimulus, foreign capital would need to be imported and the reciprocal would be a upward pressure on the USD and a much larger trade deficit. Such a configuration would also call for higher interest rates. But, how likely is this scenario? To what extent will the primary beneficiaries of this tax bill (namely corporations and individuals benefiting from lower rates on pass-through income) invest heavily in capital stock rather than use the proceeds to buy back stock, pay dividends, pay down debt, or make acquisitions? Luckily, there are a few important data series that shed some light on this. First, capacity utilization (blue line, left axis in the chart below) – the percent of operating capacity that is being used in production rather than sitting idle – shows a pattern of peaking at a lower level than each previous peak since 1973. It also remains at a historically low level currently. 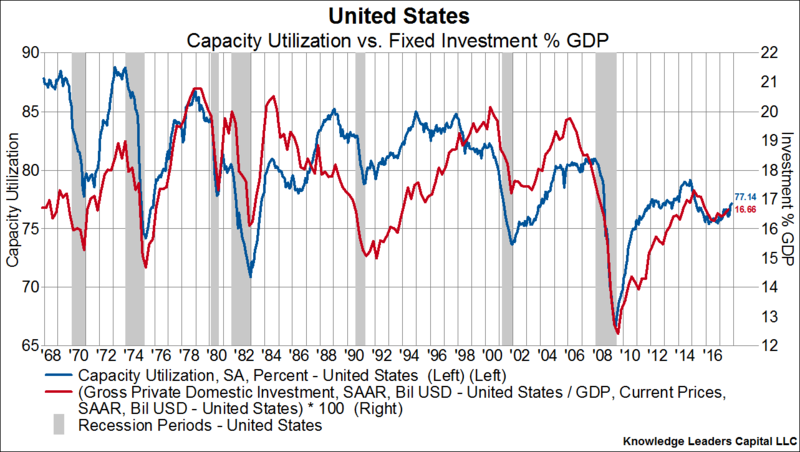 Capital investment (red line, right axis) peaks consistent with peaks in capacity utilization. In other words, we have every reason to believe capacity utilization, and capital investment as a percent of GDP, will peak at a lower level than the last cycle, which is not far above current levels. Additionally, with a still high level of capacity not being utilized, the private sector may have little need to add meaningfully to the current capital stock. Next, it’s important to distinguish between the type of business investment this tax policy promotes and that which it does not promote. Specifically, tangible fixed capital investment is incentivized while the policy is indifferent to intangible capital investment. 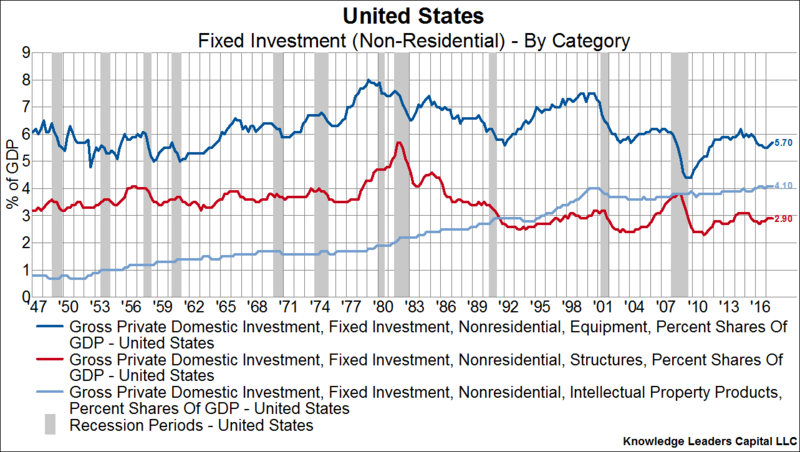 This is important because intangible business investment is the only category of non-residential fixed investment that is structurally growing (light blue line in the chart below). Therefore, given the changing nature of business investment thanks to technological innovation, its unlikely that even strongly promoting tangible fixed capital investment from a policy perspective will change the long-term trend. As we will see next, we are skeptical that this tax policy will even interrupt the long-term trend. 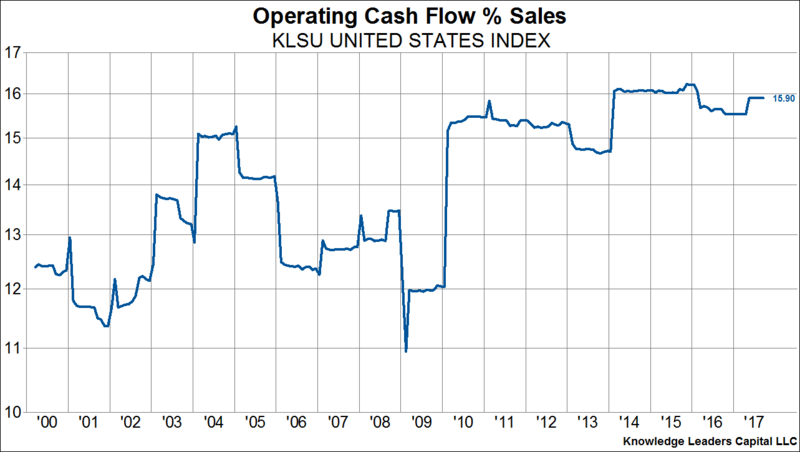 Finally, as the last four charts below show, business fixed investment in tangible capital hasn’t been declining because of lack of cash flow, but rather because businesses have preferred to save profits in order to to distribute them to shareholders in the form of dividends and stock buybacks, or invest in R&D. 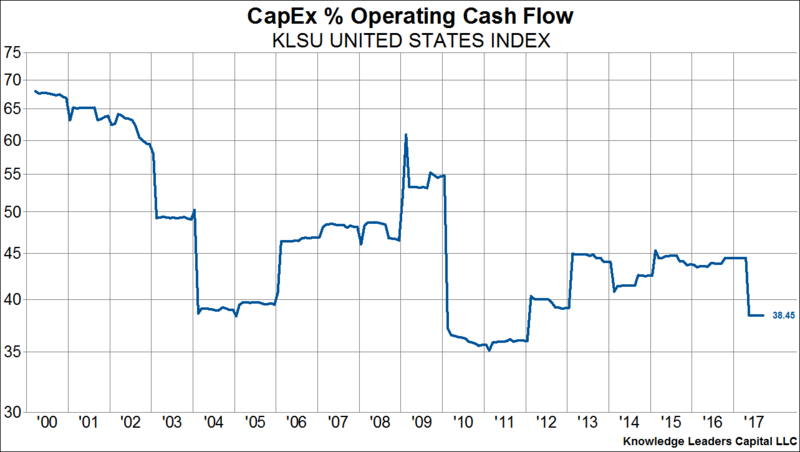 Indeed, the operating cash flow margin for the largest 85% of companies in the United States is at a two-decade high (chart 1), but capex as a percent of operating cash flow is near a two-decade low (chart 2) while dividends and buybacks have been up every year since 2011. 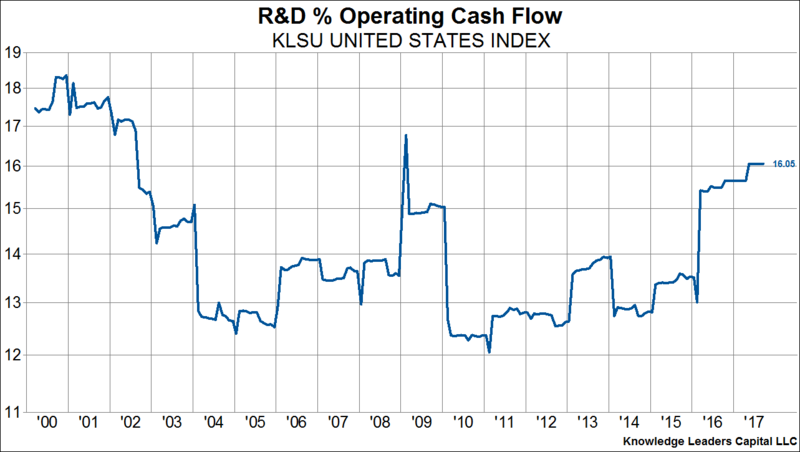 Meanwhile, R&D investment as a percent of operating cash flow (chart 4) has been up every year since 2011. This suggests to us that tangible capital investment is a much lower priority to companies than paying shareholders and investing in R&D. 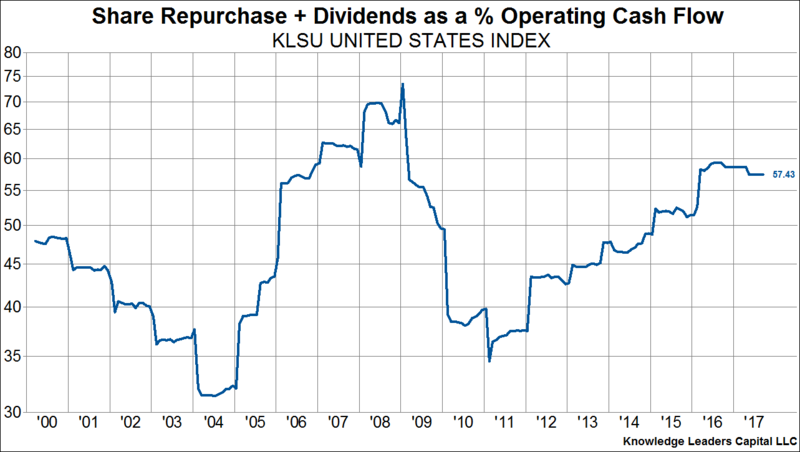 Increasing the marginal return on tangible capital investment may be unlikely to change this trend. These three important trends – structurally declining capacity utilization and structurally declining fixed investment at a time when companies are flush with cash – suggest to us that the beneficiaries of this tax plan are more likely to save, rather than invest, marginal profits. There hasn’t been an impediment to capital investment, to the contrary. As a corollary, growth in I-S and the decline in X-M may both be a lot smaller than envisioned and the USD may thus be rather unaffected the sweeping new legislation.